AT PHOENIX PRESCHOOL, WE BELIEVE THAT WITH OUR SKILLED, PATIENT TEACHERS, THE RIGHT TOOLS, AND AGE APPROPRIATE ACTIVITIES ALL OUR CHILDREN WILL HAVE A HEAD START ON THEIR ACADEMIC CAREER, AND THE TOOLS TO BECOME SUCCESSFUL ADULT. ADJUSTING TO PRESCHOOL CAN BE DIFFICULT FOR ANY CHILD, EVEN ONE WHO’S BEEN IN DAYCARE FOR A WHILE. 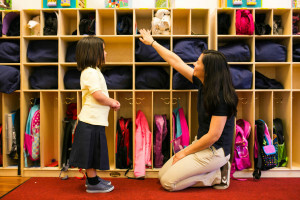 You can help ease your child’s transition to preschool with these ideas and activities. The important thing is to keep any preparation time fun. At this age, learning should not be a chore. You don’t want your child to feel like every activity is a lesson or every outing an educational field trip. When I opened Phoenix Academy, now Phoenix Preschool in 1999, I brought with me not only 18 years of teaching and supervisory experience in Early Childhood Education, but my love, patience and respect for each and every child trusted to my care. I am so pleased that you are considering our school. Like many of you, I am a working parent who understands the concerns involved in searching out the best education and quality care for your child. I remember all too well how choosing a preschool can be stressful for child and parent alike.